The Trigger Scooter car is manufactured by Trigger Technics B.V in the Netherlands. The president of the company; Jeroen Boekhoorn, first conceived the idea of a 3-wheeled sports car in 1987 and a few years later produced the first Trigger. The vehicle was powered by a Yamaha FZR1000 motorcycle engine and had a fibreglass body attached to a steel chassis. Its low weight gave the Trigger a 0-60mph time of 5.8 seconds and a top speed of around 140mph (220 kmh). At that time the market was suddenly full of 4-wheeler sports cars like the Mazda MX5 and Lotus Elise and so the commercial idea of the Trigger no longer stood. As a result only one Trigger was built and is now referred to as “Big Trigger”. Because the Big Trigger could not be commercialised Jeroen Boekhoorn started thinking about a new venture after visiting Italy. In 1999 this became the Trigger Scooter Car and then the Trigger 50. 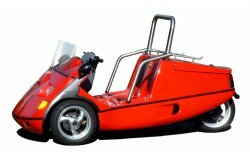 This two seater vehicle is powered by a one cylinder 2 stroke 50cc moped engine with a maximum speed of 30mph (45kmh). It has a coloured polyester body attached to a steel cage construction that also features a stainless steel roll bar. The controls are the same as on a moped with steering being via handle bars. It has successfully entered the US market and has a European Type and DOT approval. Due to increasing demand, production capacity was increased in October 2005. In 2006 Trigger Technics became a part of the Fox Group to become Trigger Cars B.V. The Trigger 50 is curently in production and exported to many countries world wide.